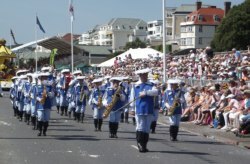 The Chesterfield Musketeers Showband are a marching band and Carnival band based in Chesterfield Derby and Eastwood, England. They are a Registered Charity (Registered Charity Number 1122519). They play upbeat popular style of music and perform arena displays and precission figure routines complimented by a colourful French Musketeer style of uniform. The instruments played are Trumpets, All ranges of Saxophones, Euphoniums and Percussion intruments. The age range of the members are 8years to 60years.